Its been a busy last couple months. The weather has cooperated in occasional spurts, and during those rare times me and the crew have been scrambling to get as much done as fast as possible before it starts raining again. The ground is persistently holding onto water, and every sunny spell we get, I keep checking to see if things are dry enough to plow or disk to no avail. I have moments of panic where I think to myself “will this piece of land be like this every spring?” Then I talk to our landlord John, and my panic subsides.. it’s just a crazy year, and all the farmers around here are struggling. There are places that John can usually drive his ATV through in late March that are still under 6 inches of water right now, and its almost June. I have to remind myself of this occasionally; being new to this land, its hard to figure out what’s the ground’s normal spring temperament, and what’s a reaction to this particularly unusual year. We found out the hard way that a stream runs through this field every time it rains… some, but not all of what got planted there was salvageable, but it looks like this will be late planting ground in the future! Despite the weather craziness we’re still pretty much on schedule. Fortunately, I plowed about half our ground last fall, so we were able to get plants in mostly on time. I’ve had to remap the fields though, as things get big in the greenhouse and their planned spot in the ground isn’t ready. The farm is starting to remind me of those puzzles with the moving squares, and one piece missing… you have to shuffle everything around piece by piece until every square is in it’s own spot. As a result, our plan is continually changing and I’ll have an interesting time this winter figuring out a crop rotation. This past week was particularly productive. 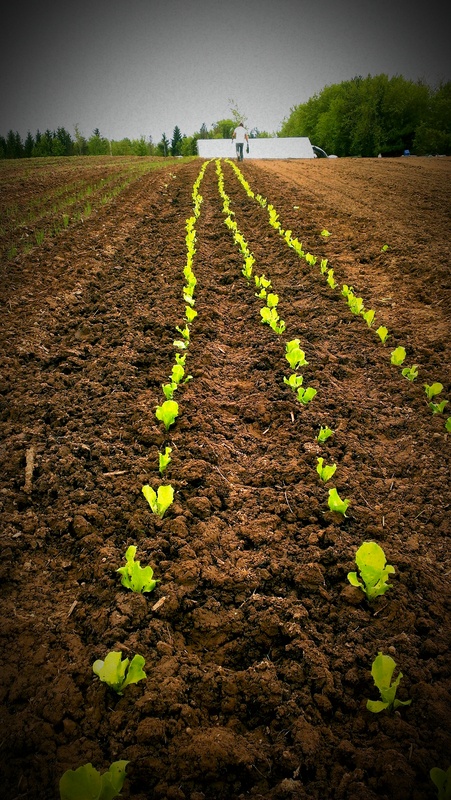 Things warmed up, and we got a lot of transplants and seeds into the field; lettuce, broccoli, scallions, cherry tomatoes, beans, radishes… I was also able to plow. John has an old 3 bottom plow that was converted to hydraulics some time in its past. He hasn’t used it for years, and offered to let us borrow it. Its exactly what I needed, as the plow we have been using is a little too big and unwieldy for our tractor. With the wet and sloping ground, its hard to use. John’s plow needed some work, and Josh and I spent some time fixing a tire, draining the hydraulic lines, and greasing her up. Then we brought her over to the farm, and I spent a few hours polishing all the rust off the shares. 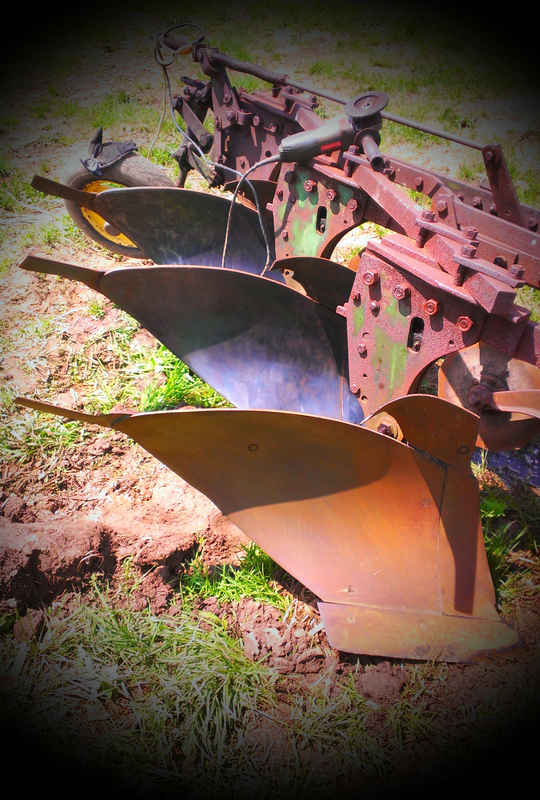 Plow shares need to be smooth and shiny; when they’re rusty, the soil sticks to them, instead of sliding off in furrows. before and after… the back two are done, the front still needs grinding. Once I got them all smooth, I tried it out. There’s a piece of ground in front of the farm that I thought would always be a swamp, but it dried up enough to plow this week. I marked out a section and gave it a go. John’s plow is great! Its much easier to control with hydraulics, and now there’s a nice little field in the front that will be perfect for pick-your-own flowers. Once I got used to the new plow, I drove it over to the next big field that needs to be worked up. 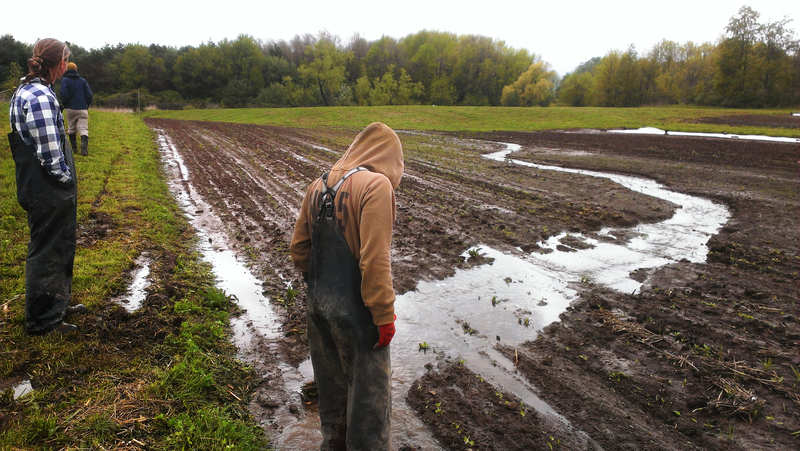 The ground is barely dry enough to plow, but I desperately need to get this field ready. The greenhouse is bursting at the seams with melons, squash and tomatoes that want to get into this field in the next week. We will probably have to move some of the seedlings into bigger pots so they can wait a little longer without getting root-bound, but looking out and seeing the freshly turned soil is a giant weight off my mind. It’s been a constant struggle this spring to stay on schedule, and this Friday was the one month mark until our first distribution. But after this week of getting food in the ground, pulling weeds out of the ground, and turning over new ground, I’m feeling more ready. This is the time of year when I always think “what if distribution starts and there’s no food! 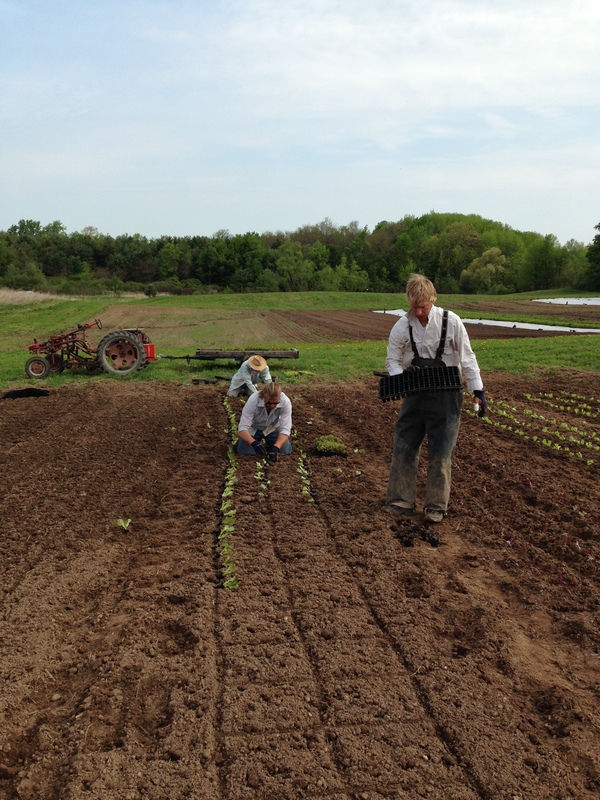 ?” and I have to stop, look around at everything we’ve done this spring, and remind myself that there will be plenty of veggies to give our members in a month.